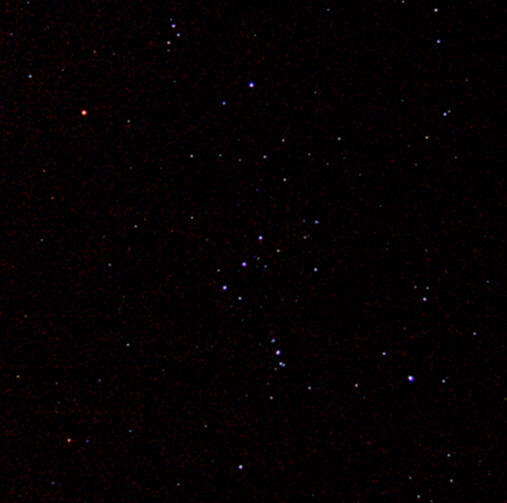 Starting out with simple compact camera and tripod astrophotography, I think the place to begin is that of wide-field portraits of your favourite constellations. You might want to try some shots at an "easy" subject like the moon, but that will normally be a disappointing start, because you will need an effective zoom-factor of around 40x or more to get a decent portrait of the man in the moon. (But you can take very nice pictures of moon-lit landscapes with just camera and tripod). But let's go for some large constellations first. Just set your exposure time as long and your aperture as large (smallest f-number) as possible and shoot a score of pictures or so (yes, it IS nice that digital images are so cheap, but remember to bring a spare, fully charged battery along). Remember to shoot a couple of dark-frames also, i.e. : Cover the lens and shoot a few blank picture at the same exposure settings. Recommended 2: If you are working on a high-resolution / high quality image where small details are important you may also consider working on a (large, uncompressed)) TIFF-file because if you save (as you will during the process) in the common, compressed and more manageable JPEG-format you will degrade picture quality somewhat each time you save your work. All detail will be preserved, when you save in TIFF-format. You may also save in windows bitmap, BMP-format but you should be aware that any EXIF-data will not be saved in that format. First, subtract your dark-frame (click on a frame to see large picture): In Photoimpact, open both frames; go to ADJUST; then CALCULATION and finally find SUBTRACTION. Place the photo as foreground picture and the dark-frame as the base-image and carry out the subtraction. (Similar functions are found in all digital imaging software of better class, although the function names and details may differ). The excessive noise in the upper left corner is a peculiarity in low-light situations for my Olympus C50Z that I don't see with my other cameras, (but they have their peculiarities as well!). Hence, I have subtracted the dark-frame twice. You will notice that there are three sliders for "input levels". The level ("brightness") of a pixel (red, green or blue) will have a value between 0 = black and 255 = the brightest you can have. If you slide the white towards the left, you will notice that the number starting at 255 decreases while the brighter parts of the image (: the stars) become more intense. Likewise, if you slide the black one towards the right, the number starting at 0 will increase and pixels with levels beyond the threshold will blacken out. The grey slider will adjust the contrast or gamma ("hardness") of the tonal range producing a darker and "harder" image towards the right (small numbers) and a brighter and more "washed out" image when moved towards the left. 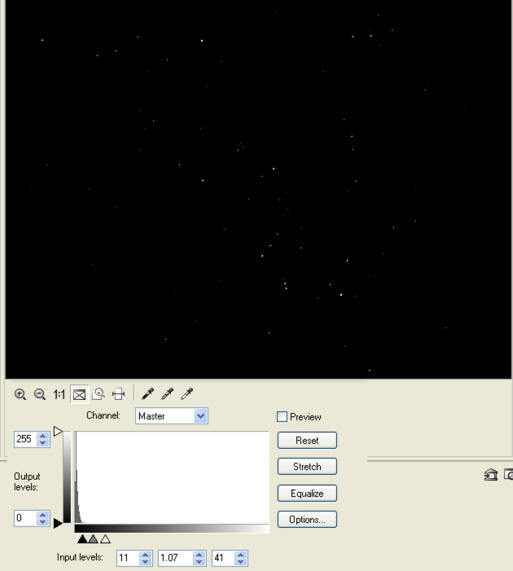 This way, we can increase the brightness of our stars while subduing background brightness and low-light noise. There are more useful features and options that we shall revert to elsewhere. One final note regarding image H above: When you de-sharpen the stars, you smear out their light and you will have to brighten the stars once again using LEVELS or CURVES. Finally, it could be interesting to see, what have we actually got? 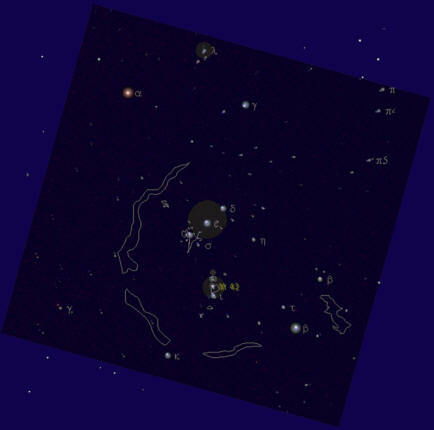 Thus I have superimposed H above on a star map produced in "Cartes du Ciel". This sandwich is produced by inserting H on the star chart using the OBJECT function and making it semi transparent using the OBJECT PROPERTIES function of PhotoImpact. The image has further been rotated using the TRANSFORM function. Surely, a good digital imaging program is indeed mandatory for the amateur astro photographer ! Comparison with the star chart reveal that we have captured stars down to approximately magnitude 6 - which is about what one may expect with wide field exposures under a not perfect black sky. If you shoot smaller star fields at longer focal lengths, (say 3x to 5x optical zoom) you may gain a couple of magnitudes as we shall see in a following chapter. 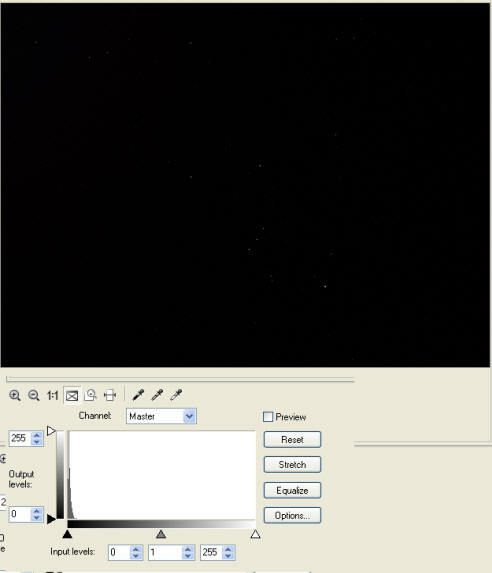 (Try aiming at a bright star in your view finder and zoom in on that star. You will soon find out what I mean then). Technical note 1: Visual and photographic magnitudes are not the same. In particular, the CCDs of ordinary compact digital cameras have a quite different sensitivity for light different wavelengths compared to the sensitivity of the human eye. For example these CCDs are much more sensitive in the red parts of the spectrum, which you may convince yourself of by watching your activated TV remote control on your cameras LCD display: In most cases, you will clearly see the infrared light pulses from the remote control. Technical note 2: When superimposing images and maps as above, it is a requirement that the projection method used for the map is the same as that used by the camera. In both cases we produce an image of the curved celestial sphere on a flat piece of paper / a flat CCD. The camera only knows one way of doing this (tangential projection) assuming ideal optics while there are different geometric approaches for map projections. Furthermore the centre of projection for the map and the centre of the photographic image (the direction in which your optical axis was pointing) must be the same (as expressed in celestial co-ordinates). I shall revert to the issue on angular distances and their measurements in a follwing, technical section. Now, that was a lengthy introduction to the simplest of all subjects, but I hope I have given you some inspiration and guidelines to get the most out of your first digital images - and that I have shown you that the fascination does not stop at the capture and download of your images but that there are many hours afterwards of exciting exploration of your heavenly accomplishments.